Gear and the handled fluid. 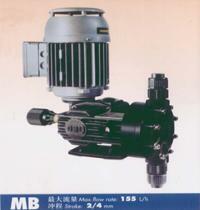 ■ Leak-free pump,due to OBL's stress-proof diapragm. ■ *大自吸高度：1.5m ■ Max suction lift1,5 m.w.c. (seeoperating manual). ■ 无泄漏隔膜泵头 ■ Leak-free diaphragm pump　head. lity with any dosed liquid.